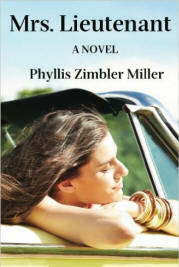 This 2008 Amazon Breakthrough Novel Award semifinalist is a story of unexpected women's friendship when their husbands attend Armor Officers Basic at Ft Knox, Kentucky, in the Spring of 1970 right after the Kent State shootings..
"I first became aware of this novel when it was an Amazon Breakthrough Novel Award semi-finalist. I read it again more recently. As a former columnist for Stars and Stripes in Europe AND an Air Force wife of 30 years, I love Mrs.Lieutenant." -- Bonnie Latino, co-author of "Your Gift to Me"
"You realize that not only did you read a good story, but you read one that stays with you on so many levels. When you learn the author herself lived as an officer's wife during this time period, it makes the unfolding story of these four women all the more intriguing." -- Tony Eldridge, author of the novel "The Samson Effect"